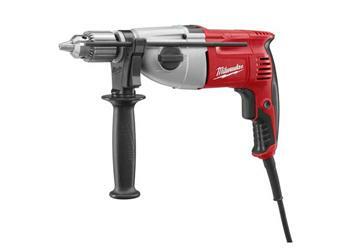 This popular 1/2 inch Hammer-Drill is now available in a kit with an impact resistant carrying case. This Hammer-Drill features a two mode selection switch for hammer-drilling in concrete or rotation only for drilling in wood. It also offers a synchronized gear shift for high speed or high torque. The compact ergonomic design has a soft grip handle and two finger trigger switch for greater operator comfort. This tool is ideal for setting concrete screw fasteners and drilling small holes for anchors. It can also be used in the drilling only mode for holes in wood, steel and plastic.